Chol Chnam Thmay is the traditional New Year Festival of the Khmer ethnic people across southern provinces. 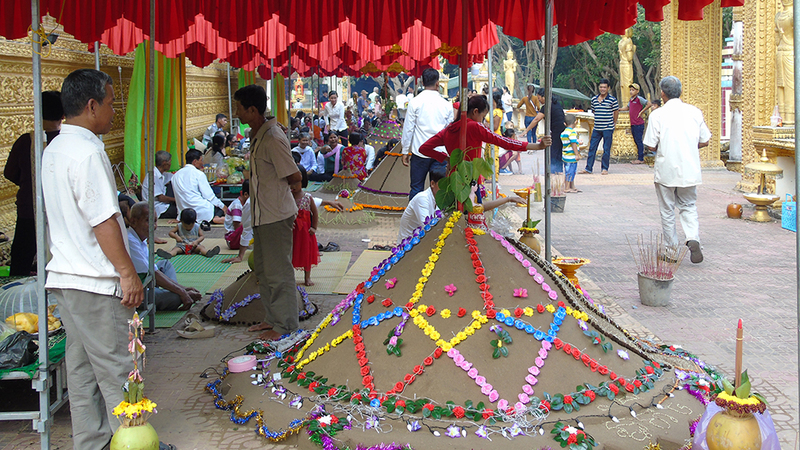 The festival, which is held annually in April, consists of numerous traditional rituals highlighting their unique cultural identities. The origin of the Chol Chnam Thmay festival of the Khmer people was explained by a legend of the Buddhist’s victory over Brahmanism. It is said that once upon a time, there was a very intelligent boy named Thom Ma Bal on earth. He was able to spread his knowledge to other people since he was seven years old. The people admired him and enjoyed listening to him preach. The rumours of Thom Ma Bal’s talent soon spread to heaven and many angels descended to the world to listen to his sermons. 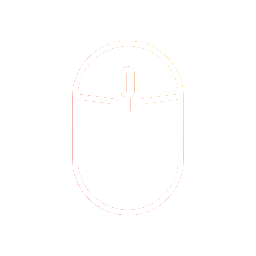 As a result, the preaching courses of Kabul Maha Prum, a superior God in the upper realm, were increasingly deserted. Because of the envy of Thom Ma Bal, God KaBul gave him three puzzles and said that if the boy could not answer, he must give his life to the God. On the contrary, God would cut his head off by himself if he had the correct key pieces. Thom Ma Bal gave the answers, therefore, the God cut off his head and told his seven daughters to keep it in a tower on the Prassume peak. He also did not forget to recommend his daughters to descend on earth to protect people and bless a year of peace and bumper harvest. Since then, on the annual death anniversary of their father, seven fairies have descended to the world, carried a tray of the God’s head to the Prassume mountain and then turned around the foot of the mountain three times in the sunrise direction. Khmer people consider that day as the first day of the New Year. 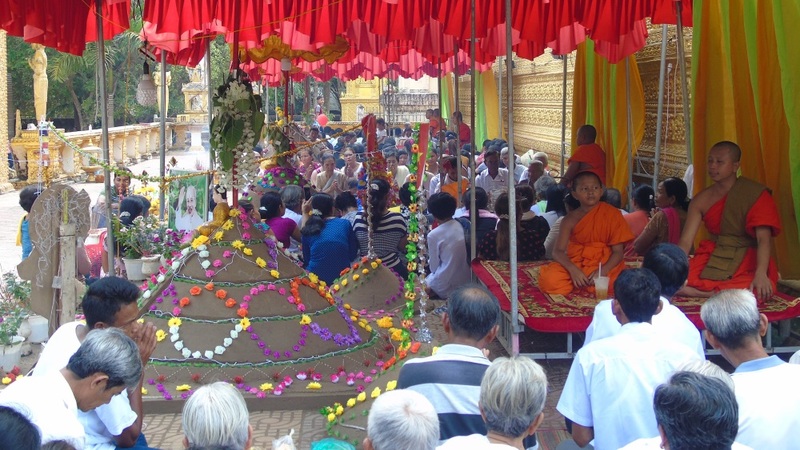 Chol Chnam Thmay Festival is the biggest cultural and spiritual event of the Khmer ethnic people. There are around 1.3 million Khmer people in ten Mekong River Delta provinces and cities, mainly in Soc Trang (with over 400,000, accounting for nearly 31% of population) and Tra Vinh (over 290,000, accounting for 32% of population). Chol Chnam Thmay is also the New Year Festival celebrated by people from Laos, Cambodia, Brunei and Thailand. The time to celebrate Chol Chnam Thmay Festival of the Khmer people is based on the Buddhist calendar. Every year, the great virtues will create a lunisolar calendar called mahasangkran to calculate the New Year’s Eve. However, the time is not at midnight like the Lunar New Year but changes each year. A Cha – a village patriarch who is always respected by Khmer villagers will inform the people of the New Year’s Eve. According to the Khmer people’s thinking, April is the intersection between the dry and rainy seasons when plants and trees return to be fresh and green. The changes and abundance of the nature are conceived as the beginning of a new year. The organisation of Chol Chnam Thmay Festival comes from the purpose of praying for the dry season passing quickly to start a new crop. Traditionally, Khmer people celebrated the New Year in Buddhist temples, which are decorated with colourful flowers and lanterns, not at home. Before offering food to the temples on three mornings, Khmer people offer incense to invite their ancestors to go to the temples with them. However, due to being influenced by Kinh people’s customs, today many Khmer families celebrate New Year’s Eve and worship their ancestors at home during Chol Chnam Thmay. To prepare for this important event, the Khmer people clean and decorate their homes and furniture, buy new clothes and make traditional cakes. 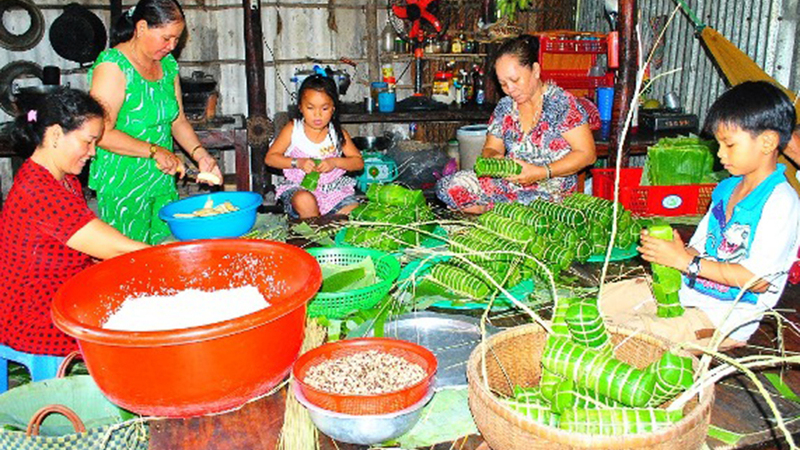 Khmer women often make different kinds of cakes, including banh tet (sticky rice cake with pork and green bean filling), banh it (sticky rice cake with coconut and green bean filling). On New Year’s Eve, the altars are placed in the most solemn places to welcome their ancestors. On the altars, Khmer people display five flower branches, five candles, five incenses and five young rice seeds as well as many other fruits. All family members sit in front of the altar for a ritual dedicated to Tevada, a god believed to be sent from heaven to protect all creatures on earth. This ritual is considered to see off Tevada of the old year and welcome the new one as well as to ward off demons and cleanse the bad and faults in the old year. On the first day of celebration (called Chol Sangkraan Thma), villagers dress up and bring offerings to the local temples for the mahasangkran procession ceremony and say the prayer for a new year. On the second day, called Wonbof, the families offer food to the monks and build a hillock of sand in front of the temples to pray for good weather and bumper harvest. The villagers prepare water and fresh flowers and then attend the Buddha bathing ceremony in the temples on the last day called Lom Sak. In addition to important rituals, the local young people hold folk games, including blindfolding, pot smashing and bag jumping. In the morning, Khmer people dress up and go to Buddhist temples, bringing offerings including incense, candles and flowers. Chaired by the senior Khmer Theravada Buddhist monk, the procession is led by a masked man wielding a staff to pave the way, followed by a Chhanyam drum troupe or an orchestra, an Acha (respected patriarch in the community) carrying a tray of offerings on his head, and pilgrims, who queue from old to young in three or four lines. Drums are beaten continuously to attract more people to join the procession. The crowds go around the temple’s main hall three times, starting from the main eastern entrance before entering the hall in order to pay respect to Buddha and welcome the New Year. In the evening, villagers gather in the temple to listen to Buddha’s teaching and the monks’ praying for prosperity for the country, and longevity, beauty, peace and good health for the people. Like a New Year’s Eve celebration, the Maha Sangkran procession aims to dispel bad luck from the previous year and welcome good luck for the upcoming year. During three-day Chol Chnam Thmay festival, Khmer people visit Buddhist temples and prepare food offerings to monks, breakfast in the morning, lunch at noon, and soft drinks, milk and tea in the evening. The food is placed in a long line in front of the Buddha altar. Before having the food, the monks chant to offer the souls of the dead and give blessings to the food givers. Offering food to the monks is an important ritual representing the cultural tradition of the Khmer people. It not only conveys the sentiment of Khmer Theravada Buddhist followers toward dignitaries and monks but also pays homage to their ancestors, the dead, and hungry wandering souls. In the afternoon of the second day of Chol Chnam Thmay festival, Khmer people join a rite to build a hillock of sand on the ground in front of the temple. The number of hillocks is different in each Khmer temple. In the majority of temples, nine hillocks are built of which eight hillocks represent the eight directions of the universe with one in the centre. Meanwhile, only one hillock is built in front of the main hall at Khleang Temple in Soc Trang province, and four are made in several temples in Tinh Bien district, An Giang province, illustrating the four directions of East, West, South and North. It is believed that every grain of sand put on the hillock will help to wash away a sin committed by the builder last year. It also conveys the people’s dream of a New Year full of prosperity with properties piled in heaps. The Buddha bathing ceremony is conducted in the afternoon of the last day of the festival. To start the ritual, a senior monk beats a drum to gather people in the main hall, before burning incense in front of the Buddha altar. Monks and Achas conduct chanting and then spray flower-scented water onto Buddha statues. After that, Khmer people queue in a line to clean and bath the Buddha statues to gain merits. Khmer people then return home and restage the Buddha bathing ritual with their family. At their house, the Buddha statue altar is always placed at the most respected place. The ritual aims to wash out the misfortunes of the old year and welcome good luck to prayers and their families in the coming year. 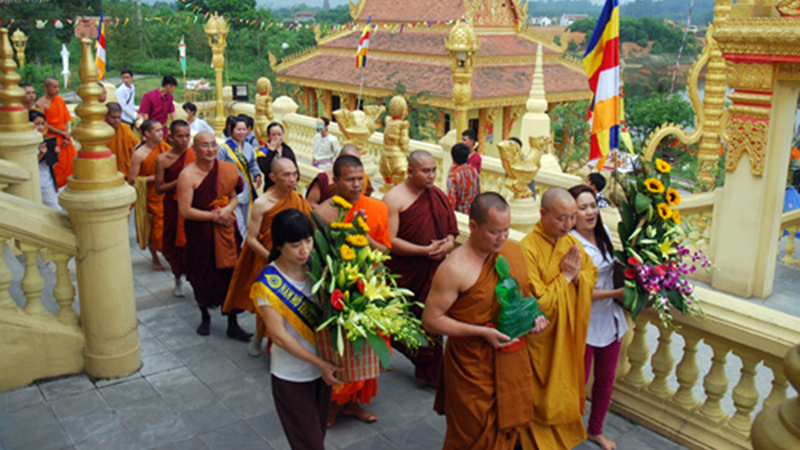 After concluding the Buddha bathing ceremony, dignitaries, monks, Acha and followers gather at the areas of towers containing the remaining of the temple's late abbots to pray for their souls. After that, each family invites monks to the towers keeping the remaining of their family members to hold a requiem service for them. Khmer people place a tray of food, cakes, and fruit on to a mat in front of the tower, burn incense, and listen to monks’ chanting. While reciting prayers, the monks spray scented water onto Buddhist followers and around the tower to spread happiness for them and their family. The requiem service is the last ritual concluding the Chol Chnam Thmay festival of the Khmer people.